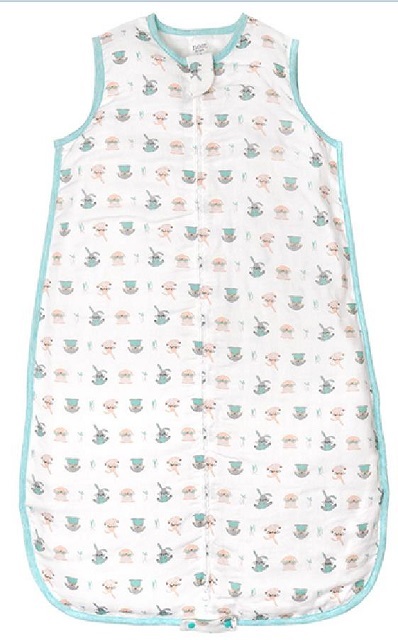 This recall involves Sleeveless Bamboo Sleep Bag TOG 0.6 made of 70% rayon from bamboo and 30% cotton, available in sizes S, M, and L. The sleeveless sleep bags come in various designs. Loose-fitting children's sleepwear can contact ignition sources such as stove elements, candles, and matches more readily than tight-fitting sleepwear, and once ignited will burn rapidly, potentially resulting in severe burns to large areas of the child’s body. As of March 14, 2019, the company has received no reports of incidents or injuries in Canada. Approximately 262 of the recalled products were sold in Canada. The recalled products were sold from May 2018 to February 25 2019. Consumers should immediately stop using the Sleeveless Bamboo Sleep Bag if the bottom of the sleep bag is open and dispose of the product. If the bottom of the sleep bag is not open, consumers should disregard instructions on "How to Open Sleep Bag Bottom" and keep their sleep bags intact. There is no issue with consumers using this product as an unopened sleep sack. For more information, consumers may contact Nest Designs by email . Consumers may also visit the company website.